Dr. Andy Johnson was a 1976 graduate of Grantsburg High School in Grantsburg, Wisconsin. He attended the University of Wisconsin, River Falls where he graduated with a B.S. degree in Music and Speech-Communication. After earning elementary teaching licensure, he taught 2nd grade in River Falls, Wisconsin from 1983-1986. He went on to teach in elementary schools in the Twin Cities area and also spent three years working in the Grantsburg School District as A 5th grade teacher and the Gifted Education Coordinator. 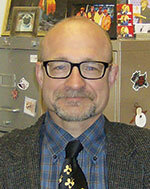 He earned his Ph.D. from the University of Minnesota in Literacy Education in 1997. He is currently working at Minnesota State University, Mankato as a professor of literacy in the Department of Special Education where he specializes in literacy instruction for students with reading difficulties. He is the author of 10 books and numerous academic articles related to literacy, learning, teacher development, and the human condition. He lives in North Mankato with his wife, Dr. Nancy Fitzsimons and his dogs Mickey and Emmet.